Locke was in anger management. Met a woman named Helen. Jack is very angry about "faith". Desmond was suckered into staying in the containment unit and inputing the number (4 8 15 16 23 42) pressing the button (execute) - told to him by one of his shipmates (? ), Kelvin. The "others" can't be the "others" - they are the survivors of the tail section, who think that Sawyer, Jin and Michael are the others (perhaps Roussaeu is pitting the survivors against each other)? Why is Jin speaking English!? Why are the tail section survivors so much more ragged looking in comparison to the other survivors? Why would Jack order the food to be kept secret? What happens to Helen and Locke? Are there really any "others"? 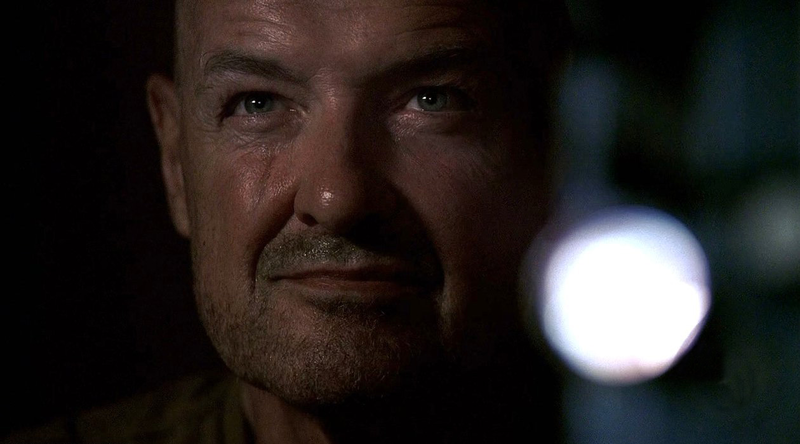 Again, what is the "creature" that grabbed Locke? How did the plane crash? Where does Desmond think he's going to run to? The whispers? What are the whispers? If you've ever been to a science museum they usually have these 2 disk like things on a wall, a person stands at each, and you can converse and hear each other clearly. There is also a spot in the room - usually in the middle - where you can hear the conversation -- perhaps something like that is happening? Alien, super-human dead ancestors with extradinary strength? There must be people who are apart of these projects that we have seen (the guy with the huge, fake beard that they showed has to be someone). I love it. My brain is entertained. Just call me fan-boy. Comments for "Lost: Recap (S2,E3)"
There are no comments on Lost: Recap (S2,E3). Please fill out the form below completely and share your thoughts with us! Comments are turned off for "Lost: Recap (S2,E3)"